I was 14 when my school pal introduced me to her 18-year-old cousin, Brian Kember. It didn’t take long for me to realize he was the one I wanted to spend the rest of my life with. When we married four years later, I saw my future with Brian stretch before me like a beautiful dream where nothing would ever come between us. We would grow old together. After 30 years of happy marriage, it looked like I was living my dream. But then disaster struck. At the age of 52 — and having previously enjoyed excellent health — Brian began to experience shortness of breath and was later diagnosed with pleural mesothelioma. My dream had turned into a nightmare. Brian would never live to be an old man. His fate had been sealed 45 years prior when his parents Vic and Dorrie moved him and his sister, Pat, to the asbestos mining town of Wittenoom, Australia. The two years I spent caregiving for Brian were the most challenging and heartbreaking of my life, but in some ways, they were also the most rewarding. Through my suffering, I learned the true meaning of love and came to witness how strong the human spirit can be when severely tested. Through it all, Brian was determined to carry on with his life despite the ravages of his disease. I was just as determined to make this possible. Mesothelioma robbed Brian and me of our hopes and dreams, but it did not break our spirit. The pain and symptom management routine I put into place made a huge difference to Brian’s well-being. He was not bedridden until three short days prior to his death. Widowed at the age of 51, I felt like my life was a jigsaw puzzle with missing pieces. It was the first time I had ever lived on my own. It’s now been 14 years since Brian died. I have come to understand grief is not something you “get over.” It is something you learn to live with. I still miss Brian, and I know I always will. Time has helped me to heal and move on with my life, but I still bear emotional scars. Time can’t erase my anger toward Australian Blue Asbestos (ABA), the asbestos mining company whose negligence caused so much human suffering. Nor has time lessened my abhorrence toward the town of Wittenoom itself. A Supreme Court jury decided ABA, which operated in Wittenoom from 1943 until the mine was closed in 1966, knew without question the working conditions would likely result in asbestosis and cancer. The thorn in my side symbolizes Brian’s death and the graveyard of the 2,000 former Wittenoom residents known to have died of asbestos-related diseases. The threat of exposure to asbestos dust in Wittenoom did not end when the mine closed. After 15 years of unsuccessful attempts to detoxify the town, contamination remains extensive. In 2006, two engineering firms conducted an official survey that found ongoing spread of asbestos tailings throughout Wittenoom’s town site, gorges, flood plains and pastures. The report warned that should the situation remain unchecked, the effect of erosion by wind and streams would feed asbestos fibers into the Fortescue River for hundreds of years to come. In response to these findings, the Government of Western Australian chose to degazette the town in 2007. It ended all government assistance, discontinued electricity and water services. By 2008, the government established a 292-mile contamination zone around the town site and surrounding areas. It deemed the entire area unsuitable for human occupation or land use. In the years that followed, the government urged all residents to leave Wittenoom, offering payment to those who did. 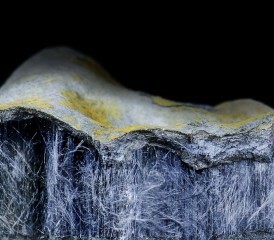 The three residents who remain today continue to discount government warnings about the high risk of inhaling asbestos fibers. Attributing their current good health to their strategy of avoiding the asbestos dumps, they steadfastly refuse to leave the place they call home. Their stubbornness is preventing a government incentive to fully isolate the town and block access from the many tourists who continue to camp in the area despite warnings against it. Robert Vojakovic, president of the Asbestos Disease Society of WA, told the Guardian he regularly met people who had contracted asbestos-related diseases from just a brief time spent in Wittenoom. Under existing laws, the government cannot take control of privately owned land unless it is to make way for public works. This may change with new legislation currently being drafted. If the new legislation comes into effect, residents will be forced to accept payment for their properties and vacate the town. Over the last decade, a number of feasibility studies have explored what it will take to clean the asbestos contamination in Wittenoom. Three high-risk areas have been identified, and the most dangerous is Wittenoom Gorge, a popular camping destination. Besides the tremendous health risks associated with cleaning contaminated areas, another obstacle is the expense. Whether asbestos is buried or removed from the area, the cost will be extraordinarily high. I hope his prediction proves to be wrong. Until the town of Wittenoom is finally shut down and the contamination dealt with, I can never rid my mind of the heartache it has caused me.